November’s Designer of the Month is Sandi Prosser. It’s quite likely that you are familiar with her designs, but probably do not know her by name. We’ve created a special selection of Mindless Knitting and Crochet Projects for all those upcoming times when you want to knit and talk and laugh. Or, if you are looking for a more complicated project, check out Investment Knitting. Lynda Gemmell designed this capelet for her stepdaughter, a young mom who works with disabled children. The gradient yarns make it fashionable, easy worsted weight knitting makes it fast, and the close fit makes it easy to wear, for all of us who need our arms free for action! This brilliant little pattern was designed way back in 2009, long before variegates were as abundant as they are now. Danny Ouelette situated garter stitch triangles at the middle and at each end. This Chevron Scarf has no need to overcome the qualities of a variegate; it celebrates them. Fiber Trends engaged cable expert Kathy Zimmerman to create the Me and My Dad v-neck sweaters. What did she create? Not cables, but garter brioche rib alternating with stockinet stitch. That does sound hard, harder than cables, but it’s not. If you can knit and purl and occasionally knit one stitch in the row below, you’re good to go. There is something so intriguing about the stitch that Jo-Anne Klim has used for her Araluen Cowl. It’s a rib stitch that twists, although only one row out of four has an actual twisted stitch on it! Need I explain more that that? Just that it is easy and there are matching fingerless mitts and hat. What a depiction of the joys of Fall to wear while you rush through the wind tunnels of city metropolises (or stroll through the woods). Bare trees have inspired this beautiful hat from Deborah Tomasello and she expresses it in her favourite technique, stranded knitting. If you are more a springtime person, take a look at Think Spring! The colour, the cowl, the coziness. What’s your favourite thing about this sweater? The addition of pockets? The size range - 32” to 52”? The optional fur yarn cowl edging? That it’s a Knitting Pure and Simple design? All of the above? Check! You couldn’t call this anything but an investment piece. It’s not difficult, but it will take a long time and use a lot of yarn and be totally worth it. The coat is knitted in pieces from the bottom up - any other method would cause the pieces to droop and drag. The edges are finished with no-curl garter stitch, there are just two different cables, and there is no body shaping. It’s beautiful and dramatic, too. It’s such a pleasure to find a pattern that is very likely to be a gift and will impress the recipients with your skill. No need to disclose that it was not at all difficult, unless you want to. The herringbone texture and stockinet/reverse stockinet stripes complement one another. Plus there’s a bunny. For a man in your life, choose a gorgeous, and admittedly time consuming, cabled sweater, a tidy hat in hunting-season orange, a wide-rib chunky weight pullover, or a not-bulky-looking bulky weight knit with streamlined side ribs. A selection of really easy, crochet-while-you-talk patterns. Most are perfect for gift giving. Among the artifacts - a 3,000 year old ball of yarn - a mere 1 cm in size. It feels so very virtuous to make optimum use of a pattern, and these sets, like the ones we suggested in October’s Gift Issue, will make you feel positively thrifty. These days, designers are well known among the knit literati (would that be kniterati?). They are celebrities, well known for their designs. But there are many talented people that have been working in the design business, behind the scenes, for decades and are virtually unknown by name. Here’s a designer that you very likely do know for her designs, but not necessarily by her name. We’re so pleased to feature Sandi Prosser and her patterns this month. Sandi Prosser has created more than 500 designs, working as a freelance designer for yarn manufacturing companies like Classic Elite Yarns, Naturally, Nashua Handknits, and Kertzer. Her designs have been featured in knitting magazines, too, like Vogue Knitting, Knit ’N Style, Creative Knitting, and Knit Simple. One of the most perennially popular designs on Patternfish is Sandi’s Weekend Jacket, designed in 2006. Ten years after the original, Sandi revisited the weekend theme and created the Weekend Jacket Revisited, the Weekend Crochet Jacket, and the Weekend Cocoon Jacket, all in gorgeous self-striping, chunky-weight yarn. The easy Caryss Cowl is a terrific example of the yarn directing the design, one skein of variegated sock weight, in this case. How did you become a knit designer? I spent most of my time as a child doing sewing, knitting, embroidery and most needle arts. I was sewing my own clothes by the age of 10 or 11. Never had I thought of becoming a designer, they were just activities I liked to do. I would knit for people for extra money in my late teens. When it came time for university I decided to pursue an Honours Bachelor of Science degree with a major in Clothing, Textiles and Design. This further enhanced my interest in textiles. Upon graduation, I really had no idea what I wanted to do, so I spent the first two years managing a yarn store and teaching knitting classes. Later, while on maternity leave from my job as Sewing Product Manager at Coats Paton, I spent my “free” time working as a home knitter and knitting garments for my soon-to-be-born daughter. It was suggested I submit designs to a publishing company for an upcoming baby book. One of my designs was selected and things snowballed from there. Contacts that I made early on in life came full circle and I soon found myself designing full-time. What is your greatest personal challenge? My greatest personal challenge is finding balance and carving out time for family. Most months I have 4-5 contract pieces to finish, so finding time to devote to self-published works can be virtually impossible. My family can sense when a deadline is approaching. They have adapted to my crazy schedule and have come to accept that I am still knitting at 4:00am or while on holidays. It is very different for each client and I have to adapt my design process to fit the needs of the client I am working with. What inspires you? The smallest thing can be a jumping off point for a new design and I tend to create a cluster of patterns based on what is currently inspiring me: a yarn, a stitch pattern, or a silhouette. I seem to work through all the permutations before I let it go and move on. Currently, I am working with self-striping yarns and Missoni-inspired stitch patterns that create movement, like the Picotee Cowl and the Annora Cowl. Do you have a particular customer in mind when you start a design? Much of my design work is on the editorial/freelance side of things, so the customer changes with the client. The magazines and yarn companies that I work with all have a very specific target market. While working as the Creative Consultant for Kertzer, I had to develop a line of patterns that had broad appeal and catered to a variety of customers. Do you have established goals for your business other than the important issue of selling patterns? Selling patterns is important to anyone who designs, but it is just as important that I am proud of what I do and accomplish. I really function under two umbrellas; one incorporates my editorial/freelance work and the other, my self-published designs. My goal is to expand the self-publishing side while maintaining the other. I couldn’t imagine one without the other. What did you have to learn or unlearn to be a designer? I believe that as a designer, you are always learning something. I taught myself to crochet (and write crochet patterns) when a client asked if I could design a crocheted piece. There was no way I was going to shut a door by admitting I had never crocheted, so I immersed myself in crochet books. Designing is all about adapting, whether it be to trends, new yarns or new approaches to pattern writing. Are there things in your life you needed to change to accommodate your design work? I am still working on making changes in my day-to-day life to accomplish everything I want to. Finding a balance between editorial and selfpublishing is a very challenging thing for me. Throw in my family and home life and something always gives; usually it’s “me” time. Luckily, I am the type of person who thrives with chaos and deadlines. Which designs are your personal favourites? Every design is a personal favourite until I start working on the next one. I think I have well in excess of 500 design credits. Editorial work timeframe from start to finish can be as much as a year and I sometimes forget about the piece. Seeing it in print, I am instantly taken back in time. The internet has become so important to selling knitting and crochet patterns. Are there any negative aspects to it? As with everything in life, there are always pros and cons but overall, the internet has opened the door for knitting and crochet designers to a world-wide market. Sites such as Patternfish have allowed professionals and budding designers to showcase their talent. I love browsing through and checking out what others are doing and creating. It’s inspiring! Where do you think you and your business will be in 10 years? Do you have any unfulfilled wishes or dreams for your business or yourself? In 10 years time, my husband will most likely be retired. Fortunately designing is something that can be done anywhere in the world. As long as Fedex delivers, maybe I will be enjoying his retirement on a beach! What could be sweeter than knitting with toes in the water? I would like to develop a better balance between editorial and self-published works, and at some point branch out and design a line of children’s pieces. (Ed. Here are a few of Sandi’s designs for children and babies. How did you come to the decision to list your patterns with Patternfish? I have known Julia, the Prime Minister, since my days at Kertzer and remember when she was starting Patternfish. I have always admired and appreciated her drive and passion for promoting others that work in the industry she loves. Many of my editorial and contract designs were already listed on Patternfish, so when it came time to self-publish my designs, it was just a natural fit. There are many choices for designers wishing to sell patterns in today’s internet-based world, but being Canadian, how could I not support a Canadian business? Find patterns from Sandi Prosser Designs here and all of Sandi’s designs, including the ones designed for yarn companies, here. Don’t miss the Christmas stockings, featuring either reindeer or hearts. In October, Patternfish welcomed three new designers. Lindsay Endean’s simple, charming designs for babies in Sproglets Kits lets the deliciousness of babies show through. The blanket is a simple affair of garter stitch and alternating knit and purl squares. Her hat, mitts, and bootees set was inspired and road tested by her own three month old daughter. We love the hat top-knot. Marcelline Simonotti designs cozy covers for both babies and tea pots. Her adorable set of hat, booties, and onesie makes use of ribbing, stripes, garter stitch, and stranded knitting (for the booties only). It would look great in other colours, too. Create your own exotic looking bee! Simonotti’s fun tea cozies are inspired rabbits and boxed chocolates. Laimute Vaiciuliene’s preferred person to design for is herself. Her designs are cozy, big, warm, and definitely made for cool or cold climates. They are easy to knit and the gauge is huge - fewer than 3 stitches to the inch. The sweater can be worn either way up for maximum versatility, and the poncho pattern includes a cowl. Christmas, Hanukkah, trips to the Caribbean, stay-cations - all of them demand mindless projects that don’t need your constant vigilance to stay on track. Here’s a selection that will keep your hands busy while you talk, laugh, and simply enjoy. These are some pieces that might require serious thinking - is it worth it to spend the time and money on these? The answer is ‘yes’ if you like the idea of an investment piece that will be with you for a long time. A coat is a time and yarn consuming project, so it’s important to choose a pattern that will really work, like Chris de Longpre’s The Lucy. It’s swingy style, pockets, texture, and wrap closure will make it an easy to grab favourite, especially if you make it in a standout colour. Look hard at the photo of the very special Old World Guernsey. The colour is stunning, but it makes the classic stitches hard to see. Charts make the knitting easy to follow and the stitch patterns will become intuitive. Yarn Stories’ Pevensie is the cable investment choice. We love the body-lengthening cables that begin at the hem, replacing the usual ribbing, and continue all the way to the neck. Make it a size or two bigger to get some slouch. 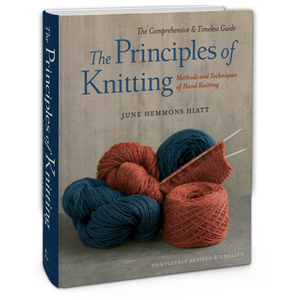 Our knitting craft today owes much to the people who went before, among them, June Hiatt, who published an amazingly complete book on the subject, The Principles of Knitting, in 1988. Read all about how Hiatt came to rewrite the book at the website. Local knit stores are just one of the businesses, like bakers and butchers, that Hiatt values for their knowledgeable service, employment, and payment of local taxes. She encourages her customers to pay a little more and buy her book from a “real store”, their LYS, rather than on-line, noting that her income is the same regardless of where it’s purchased, and “you will get something of value besides the purchase itself”. I love taking close looks at the varied output of designers and Sandi Prosser’s creations are no exception. While some designers concentrate on just one technique (not that there’s anything wrong with that! ), Sandi uses cables, stranded knitting, lace, and designs in both knit and crochet.